Why is it important to be responsible? This is an Essential Question our school is exploring across the grades through our current whole school inquiry. The vehicle driving the learning into this question is an exploration into the health of our environment. We have been overwhelmed with the level of engagement this inquiry has provoked. How did we start? We started with a provocation that sparked curiosity and enthusiasm among the students. The announcement came that a documentary would be filmed at the school to capture the care we take with our school environment; specifically the grounds and the organization of waste. There was both excitement and skepticism. As true critical thinkers, some of our older students went straight to Google to discover if the announced letter writer and film company were in fact real, and then debated the validity of the announcement. This was a wonderful demonstration of our students’ ability to question and analyze. The second aspect of the provocation was to explore our waste. Over two weeks our school waste was collected and then pulled out of the bags on Monday to see how we are doing. The overall sentiment was that we could do better and our problem was Defined. During the year Mr. Meneses goes out twice a day to pick up our litter, something the students were unaware of – they just thought we were litter free but we aren’t. When they saw the mix of organic, recyclables and garbage in the same bags they were made aware that the organization of waste that we thought we were successful with, may not be the case. Finally, when we collected our baseline data of waste on the grounds, they made connections to how those 1700 pieces of litter (24lbs) can negatively impact the environment. From this, our students expressed the need for us as a school to take action and our inquiry cycle began. Over these first two post-Spring Break weeks our younger and older students will be working in grade level and multi-age groups to Discover more about the impact waste has on our environment so that we may make the necessary changes to both organize our waste appropriately, and teach others why taking responsibility for our environment is important. Our Dream being that we can articulate that responsibility and deliver a public service announcement to teach others about some aspect of garbage/recycling and organics that we are passionate about. The passion has been on full display this week. Our older students are creating learning opportunities for their multi-age cohorts, students are investigating and talking abut the issues at home, and all our students are asking excellent questions and sharing brilliant ideas. 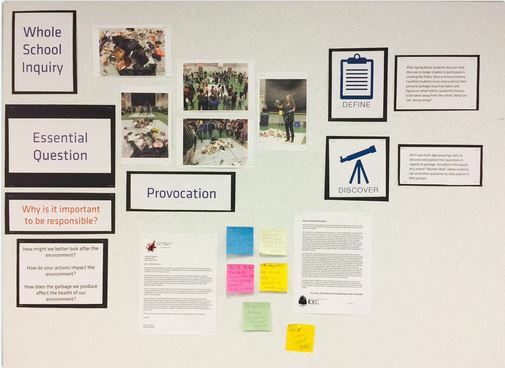 The school as a whole is incredibly engaged in the inquiry process as demonstrated by the emotional connection they are having with the issue. Short stories to teach the younger students, 3D interactive posters, stop-motion animation and so much more. The power of the whole school inquiry is that students across the grades are learning together and having conversations that serve a common purpose while connecting to learning objectives across the BC curriculum. At the assembly on Monday the students were challenged to “change the world”. We are very proud that Caulfeild students are demonstrating that they have the drive, character and tools to be that change. Here are some of the resources we are using in different classes as appropriate. We invite you to look through the resources, ask you child questions and engage with us in this inquiry.